Mexican immigration authorities rescued over 100 Central American migrants who were left to die in a truck trailer. The 55 children and 48 adults were left without food or water for two days, according to reports. 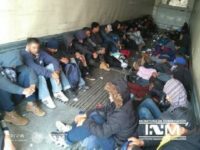 Immigration agents also found 88 additional migrants packed into a bus with a seating capacity of only 42.